We are in a new phase of On Demand Business. Companies must respond to fluctuating market conditions and provide products and services on demand to customers. DB2 for z/OS and IBM eServer technology enable you to maintain your company’s core competencies. They help you to manage global market and competition changes with consistent availability, security, and privacy, everywhere, all the time. DB2 continues to deliver rich functionality for scalable and highly available data for enterprise-scale, on demand applications. Combine the power and capacity of IBM eServer zSeries and the high performance and high availability of z/OS with the new version of DB2. In doing so, you’ll expand and extend your applications in the increasingly competitive on demand environment. DB2 Universal Database (UDB) for z/OS Version 8 delivers power, flexibility, and DB2 family compatibility through synergy with zSeries and z/OS. 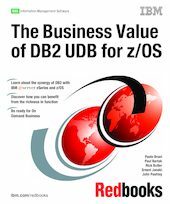 This IBM Redbooks publication helps you to position DB2 UDB for z/OS as a springboard for the future. It examines how DB2 Database Servers integrate with, and enable the sharing of information across, multiple platforms. It looks at how the zSeries 990 server manages the explosion of data with reliability and security. Plus it explores how DB2 autonomic computing functions reduce the skills and staffing requirements to minimize cost outlays and reduce risk.